Lithuanian leisure charter carrier Small Planet Airlines has announced expansion of its route network in Asia. Besides Cambodia, where the airline has been operating for some time now, it has added two new countries, Saudi Arabia and India. The carrier explains that the move comes as a solution to seasonality issue. “In the summer season, we perform most of our flights in Europe. However, in the winter we face a challenging question of how to utilize all the fleet of 21 aircraft. Asia came as the best answer because it has a reverse seasonality and its holiday market is growing rapidly,” Vytautas Kaikaris, CEO of the Small Planet Group explained. According to him, several aircraft will be based in Asia. Today, the group runs two affiliate offices in Cambodia – in Phnom Penh and Siem Reap. The later also serves as the airline’s base airport in the country. In the winter of 2016 two of the carrier’s Airbus A320s are based here. In cooperation with its local partners Sky Angkor and Cambodia Angkor Air, Small Planet operates domestic flights in Cambodia. It also offers flights to China, South Korea and Vietnam. Two more A320s have been dispatched to the carrier’s Indian base in Mumbai to operate domestic flights in cooperation with the low-cost carrier Go Air. The third Asian base is Saudi Arabian city Jeddah. Two Airbus A321s and an A320 fly local routes to Jeddah, Ha’il, Riyadh, and Dammam. The airline’s partner in the country is Nesma Airlines. As for the European market, Canary Islands, Dubai, Egypt, and skiing resorts remain among the Small Planet Airlines’ main winter destinations. Before the end of the year Small Planet plans to open its 12th base in Amsterdam’s Schiphol Airport. Currently, Small Planet Airlines operates twenty-one aircraft under their AOCs: seventeen 180-seat Airbus A320s and four 220-seat Airbus A321 aircraft. The group operates out of 11 bases and serves more than 45 leisure destinations. 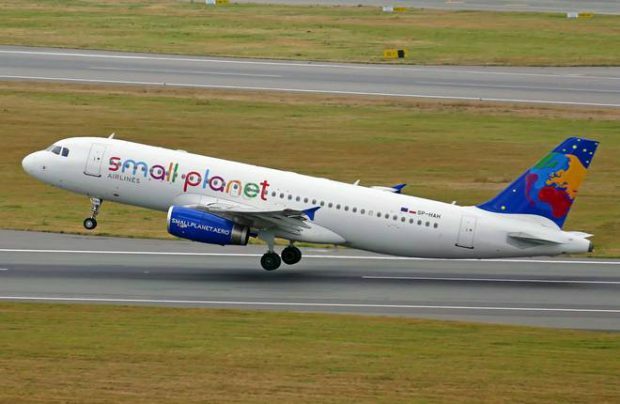 Small Planet Airlines carried 1.8 million people. Its revenue grew to 182 million euro, profit amounted to 19.2 million euro.